Batter Bakery: Support us with edible credits. Batter is a boutique bakery specializing in unique, handcrafted baked goods. Our All-American sweets are made using premium ingredients and fresh, seasonal flavors. Baked in small batches, our sophisticated yet classic treats will satisfy everything from an afternoon sweet tooth to an elegant event. We create decadent sweets with a warm, personal touch for individual and corporate clients, weddings & birthdays, and special occasion events. We source all of our produce (with the exception of bananas!) from local farmers and use only what is in season. You won't find pumpkin bread in July around here. Whole grain flours are incorporated into the majority of our baked goods items, and many of our dessert treats as well. Try a whole grain muffin or buckwheat scone - you may be surprised by how much you like it! Our baked goods are packed with organic flour and grains; premium chocolate and spices; sustainable Madagascar vanilla; Jacobsen salt, and local dairy and eggs. Batter was created by owner Jen Musty in 2008 out of a passion for baking; a unique creative energy; and a love for bringing people happiness through wonderful food. A mom-taught & self-taught home baker, Jen was driven to start Batter by her entrepreneurial spirit & lifelong affinity for creating delicious treats. 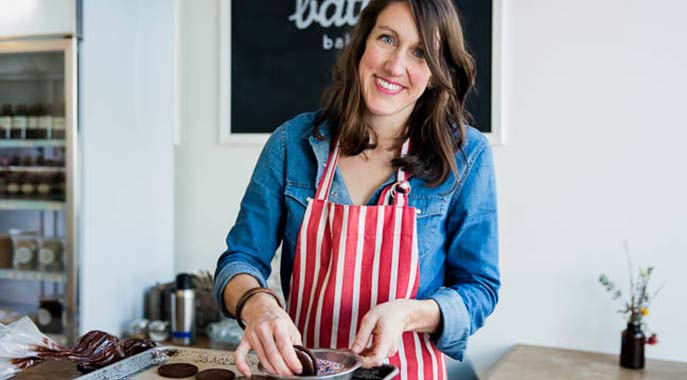 With no professional pastry training or food industry experience, Jen's journey with Batter epitomizes what it really means to build a business from the ground up. After nearly eight years of sharing kitchen space, from commissary kitchen to brick & mortar shop, Batter is finally moving to its own home! We are in the process of building out our new baking kitchen + cafe, and need your help to raise funds for equipment purchases. Our new equipment will allow us to increase production efficiency, reduce energy use, and offer the neighborhood a great spot for decadent baked goods and handcrafted espresso!